I’m MAD excited for #NoExcuses 2015! I'm MAD excited for #NoExcuses 2015! Guess what I’m doing this week?!?? 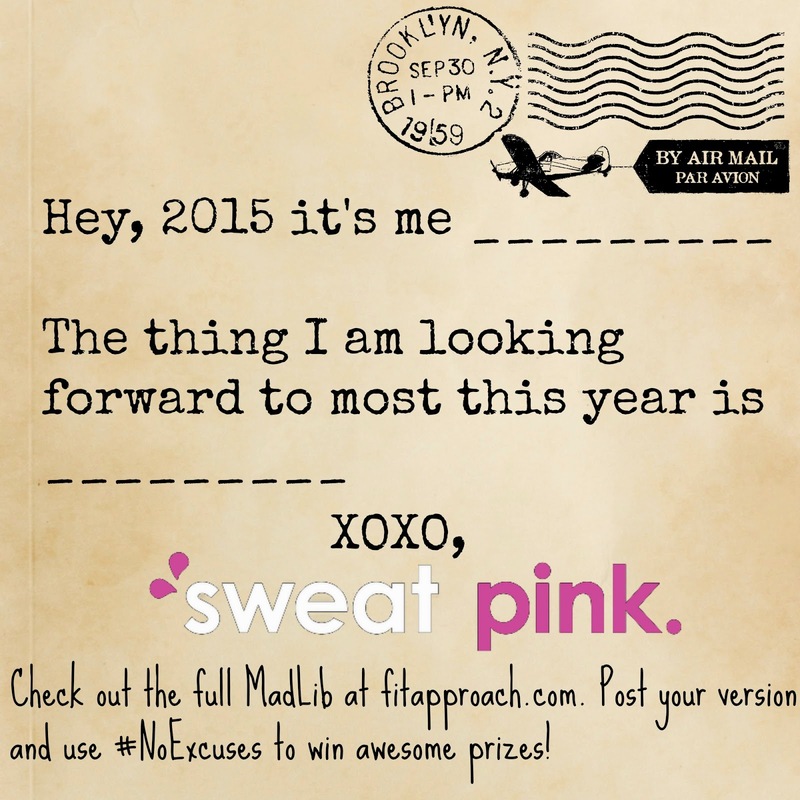 It’s the first week of the #SweatPink #NoExcuses challenge and I am just sooooo excited I could…..MAD LIB! It’s only been a few days but I can already tell this is going to be a super fun challenge. With weekly prompts that include, burpees and squats and not to mention awesome giveaways from sponors like Augusta Active, ShowerPill, ActivMotion Bar, Beaming with Health, Actio926, WIN Detergent and Sasquatch Racing I can already see I’m in for a good time. In fact, to spice things up the ladies over at Fit Approach sent us a mad lib….what’s more fun then mad libs?! Hey 2015, it’s me Priscilla Loves to Run. This year I would like to finish the Cowtown marathon without dying, race an olympic distance triathlon, and prepare for my first ever half Ironman in November. It would also be super duper awesome if I completed at least 5 of the triathlons on my race calendar this year. It’s not a resolution, though, just a reminder to myself to try and have the best year yet because 2015 is all about getting back to my training. The thing I am looking forward to most this year is racing and being more active. I’ll use the one thing that truly gets me out of bed in the morning which is my husband pulling the covers off to help me get up, get my rocky onand get after my #NoExcuses 2015. Speaking of excuses (ahem), my very favorite excuse is lack of time and I have used it to get out of doing housework and strength trainingon more than 1,000,000 occasions. I vow to move my body and be more healthy this year even if it means I have to give up pizza and sleeping in on the weekends. Even if my alarm clock gets eaten by the dogcat (I have a 20# cat) in the middle of the night, I’ll still get up and get my rocky on when I wake up. I will stop blaming the husband and kids for eating the rest of the Nutella when everyone knows it was really me. My busy schedule is not the reason I make excuses. I will show my busy schedule who’s boss this year and get my swim, bike, run on. I know that strength training is better than cardio. I will reward myself by honoring the rest day and keeping it holy. No Excuses 2015 has just begun and already I am imagining myself a winner. I can’t wait to rock a freedom pullover from Augusta Active. I can’t wait till my sweaty friends are jealous of how fresh, clean and unsalty I am between workouts with help from ShowerPill body wipes. I can see myself rocking Cowtown Marathon in new pair of perfect stride leggings with a tab it over jacket from Actio926 and looking fit and fly while doing it. And of course, I’ll be taking my workouts to the next level and improving my strength and flexibility with my new ActivMotion Bar to help me train for my next 10K race with Sasquatch Racing. eats and nutrition from Beaming with Health! Tag, Tweet, shout-out, call, text, fax or email 3 friends to take this survey and share how they will have a #NoExcuses 2015. Remind your friends to simply fill in the underlined parts! Use the #NoExcuses hashtag and post to win prizes from Augusta Active, ShowerPill, ActivMotion Bar, WIN Detergent, Actio926, Beaming with Health, and Sasquatch Racing.